Earlier today, the back half of Fuller House Season 3 debuted on Netflix, and fans who have already binged to the season finale were treated to quite a unique reference from the TGIF days of the original Full House series. 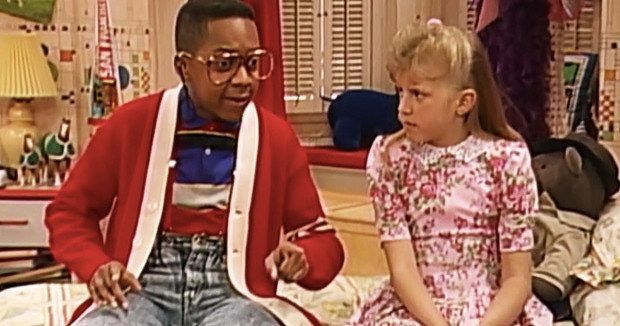 The finale featured a familiar face from the original series that resurfaced, which leads DJ Tanner (Candace Cameron Bure) to wonder who else they could track down from their past, stating, "I wonder what Urkel's up to?" While that line may have just been a fun little nod to a 1991 crossover episode of Full House, where the beloved Family Matters character made an appearance, it seems series creator Jeff Franklin may actually be bringing in Steve Urkel (Jaleel White) for Season 4. Both Full House and Family Matters were produced by Miller-Boyett Productions and Lorimar Television/Warner Bros. Television, and with both shows at the height of their popularity in 1991, this minor crossover made sense. In the 1991 episode, Steve Urkel was the cousin of D.J. 's friend Julie (Tasha Scott), who gives Stephanie Tanner (Jodie Sweetin) some valuable advice, after learning that she has to wear reading glasses. While Fuller House has not been shy about bringing in characters from the original series, many didn't expect that throwaway line about Urkel to be a hint at things to come, but that just may be the case. Here's what Full House and Fuller House creator Jeff Franklin had to say about the possibility of bringing Steve Urkel back to the small screen. "I loved when Urkel was on Full House, so I'd love to see him back on Fuller House. I'm good friends with Jaleel, and we've talked about it. It's a really big deal for Jaleel to bring this character back, so I'm not sure that he wants to, but if he does decide to, this would be a great way for him to reprise the character. And who knows, maybe that'll happen. I'd love to see it. I think everybody's curious about whatever happened to Steve Urkel, so the audience would really enjoy it. We have some fun ideas, so we'll see how that shakes out." Fuller House Season 3 was much bigger than the first two seasons, with 18 total episode split into nine-episode halves, five more than the first two 13-episode seasons. As of now, Netflix hasn't officially announced new episodes, but that may be coming in the next few days, if they follow the precedent set last year. On Christmas Eve, it was revealed on the show's social media channels that Fuller House was renewed for Season 3, and with this new season just coming to an end today, it wouldn't be surprising if Netflix gave Fuller House fans another Christmas present this year by issuing a Season 4 renewal. Both Full House and Family Matters were two of the most successful shows on the original ABC TGIF lineup, with Family Matters running for 9 seasons and 215 episodes with Full House running eight seasons and 192 episodes. Fuller House Season 3 also celebrated the 30th Anniversary of Full House, debuting on the exact date (September 22) that Full House debuted on three decades earlier. TV Line broke the news about Steve Urkel's potential return to Fuller House, but nothing is set in stone quite yet.